Increase customer loyalty by enabling registered clients and guest visitors use numerous discount coupons for one order. Go to Marketing section and check cart price rules with coupons. 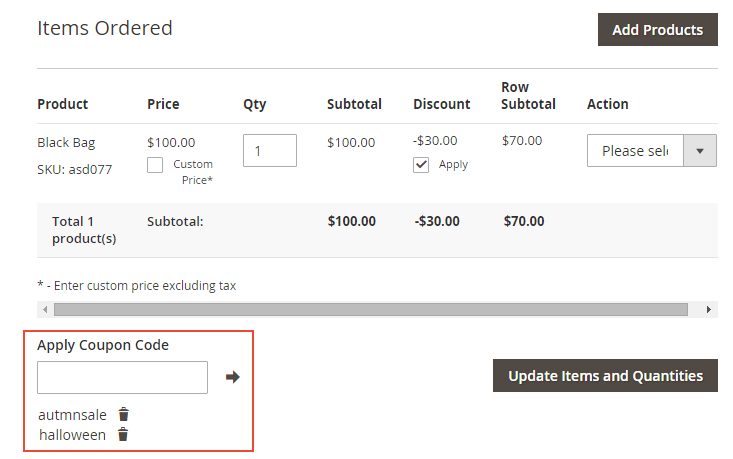 Native Magento functionality doesn't allow customers to apply several coupon codes to one order when they meet conditions of different promo rules. This 'small' inconvenience may result in customer churn and lost sales. With the Multiple coupon codes for Magento 2 extension you'll enable online shoppers to apply all available promo codes to order and get maximum possible discount. Positive shopping experience will definitely increase customer loyalty and inspire store visitors to buy more. 'Multiple coupons' feature works not only for authorized customers, but for guest visitors as well. This option will be highly appreciated by online shoppers who prefer making purchases without getting registered. Display the list of Magento 2 discount coupons that have been already applied on the shopping cart page, so that customers will be able to easily track active and inactive codes while making purchases. The list of codes is also available on the checkout page. Magento 2 multiple coupons extension clearly shows the discounts which customers get after application of promo codes. In case a store visitor decides not to apply some or all of the coupons, he/she can easily remove them right at the shopping cart page or during checkout. So your online customers stay in control, which helps you build good rapport. Follow the link for more ideas. In case one of the shopping cart rules offers a huge discount and you don't want its coupon to be used together with other Magento 2 discount codes, you can specify the list of codes that will be used individually. With the module you can apply and remove multiple coupons when creating orders from the admin panel. Apart from profit, coupons may help you build online presence and customer reputation. Click here to learn more. I sell many folk holiday clothing elements and often make coupons valid till a date. Recently something went wrong. For the holidays this shedule coupons didn’t work. People were coming for bigger sales, but could only use fixed discount. Luckily, the team fixed this issue fast, now I can use schedule coupons at full. I really enjoy working with it. It helps give out many coupons, and I no longer lose money when customers collet coupons and use them in bulk, I’m in control. Most of all I like that exclusive coupons feature. I do have generous offers (up to 70% off) and using this one with other coupons leaves me with 0 profit. But now the other way around. Useful, you can design discounts and give them to customers, it’s easy to set up and apply, but recently I noticed that customers couldn’t use several coupons at once, the app showed there was an error. To save my hotel reputation, I addressed the tech group and the guys helped me in 4 hours. Great result but it'd be better if it worked from the strat like it works now. Really cool module! Customers can control discounts that we offered, what they used, what they still have. Support is willing to help any way you want. I had the conflict with a 3d-party extension but Amasty solved my problem and now everything works out well. The module has a plenty of useful features and perfectly runs with the auto add items promo, which is in the nick of time for me now. After I migrated to M2 I decided to upgrade multiple coupons to the next version too. Honestly, I was ready for some technical glitches. However, nothing of the kind! Everything works swimmingly and the module hasn't lost its functionality at all, thanks for your job. This is the only extension of all I've installed for Magento 2.2 that works perfectly with the version. It didn't act up and I'm totally satisfied multiple coupons of different promo rules are applicable together now. It helped me a lot to motivate people to buy toys and other things for home animales. But I just found a problema - some customers managed to use 1 coupon 2-3 times. I tried to fix myself, but no good result. So I wrote to support, they made it okay. This extension works like a charm when you're sending out a campaign for holidays and you send an additional email to loyal customers so they can add a bigger discount. – Fix: invalid form key issue was fixed. – Fix: issues with multiple coupons and PayPal Express Review page were resolved. – Improvement: many improvements were made to error message display. Now error messages accurately reflect status of applied coupons in unorthodox cases, for example when coupons are entered in bulk separated by comma. – Fix: coupons containing spaces now apply correctly. – The issues with applying and display 'Unique Codes' were fixed: now a user can apply only one unique code at a time and it cancels any other coupons from the same rule.